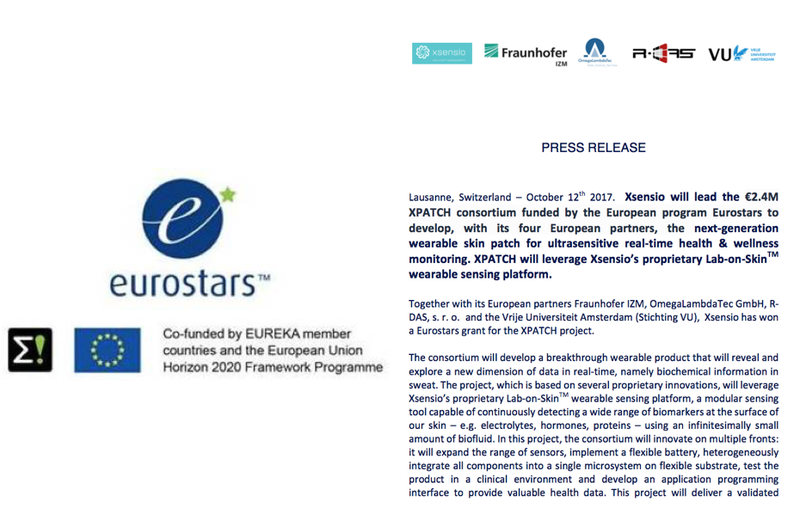 Together with its European partners Fraunhofer IZM, OmegaLambdaTec GmbH, R-DAS, s. r. o.
and the Vrije Universiteit Amsterdam (Stichting VU), Xsensio has won a Eurostars grant for the XPATCH project. The consortium will develop a breakthrough wearable product that will reveal and explore a new dimension of data in real-time, namely biochemical information in sweat. 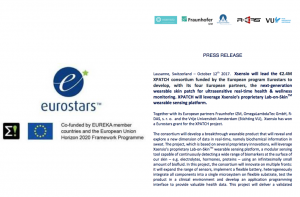 The project, which is based on several proprietary innovations, will leverage Xsensio’s proprietary Lab-on-SkinTM wearable sensing platform, a modular sensing tool capable of continuously detecting a wide range of biomarkers at the surface of our skin – e.g. electrolytes, hormones, proteins – using an infinitesimally small amount of biofluid. In this project, the consortium will innovate on multiple fronts: it will expand the range of sensors, implement a flexible battery, heterogeneously integrate all components into a single microsystem on flexible substrate, test the product in a clinical environment and develop an application programming interface to provide valuable health data. This project will deliver a validated XPATCH, which is compatible with current wearables on the market. Sign up for our newsletter to get reports of our most recent activity.